In mid-January, Logan and I drove to Ashland, Oregon to see an art exhibit called "Exploring Reality" at the Schneider Museum of Art. On the drive, I kept talking about Sleeping with Cats, a memoir I'd just read, because the author's life intrigued me. While I was talking to Logan about the book, I thought of a new series of articles to share on RowdyKittens.com. Throughout 2016, I’ll share monthly summaries of the books I enjoyed reading. Essentially, books have helped me deal with positive and negative life changes such as coping with loss, changing careers, simplifying my life, and becoming more creative. Plus, spending my time reading instead of surfing the Internet or watching TV has improved my daily life and mental health. I hope my monthly book summaries help me to become a better reader and writer. Also, I hope this series provokes feelings of literary inspiration in you, too. Let’s get started with my book review series. Here’s what I read in January 2016. 1. Into Thin Air by Jon Krakauer was the first book I read in 2016. I felt like I was reading fiction because there was so much drama and suspense within the pages. However, the book was a very real and personal account of a horrible tragedy. 2. I’m a big fan of Marie Kondo’s work and I enjoyed her latest book—Spark Joy. The book was filled with cute illustrations, and the sketches were handy because the visual cues helped me understand Kondo’s method of folding clothes. Also, her suggestions inspired me to reorganize my closet, pantry, bathroom cabinet, and more. If you need help letting go of stuff and figuring out what sparks joy in your life, read Kondo's book. 3.Sleeping with Cats by Marge Piercy is an incredible memoir of Piercy's writing life, relationships, and her involvement in the civil rights and women's movements. I thought the memoir was brave and honest, especially when she wrote about open relationships, monogamy, and her experiences as a progressive organizer. My favorite parts of the book included Piercy's descriptions of the cats she's loved and lost in her lifetime. Piercy closed the book with wise words. She said, "Cats continue to teach me a lot of what is important in my life, and also, how short it is, how we need to express our love to those for whom we feel it, daily, nightly, in every way we can. With everyone we love, we have only a limited time, so we must learn to celebrate it body and soul. They have taught me how precious every moment we can enjoy can be with whatever we love because it all passes and so do we." 4.What Now? by Ann Patchett is based on her commencement address that she gave at Sarah Lawrence College in 2006. Patchett's little book offered me hope and inspiration and reminded me to embrace uncertainty as a powerful force in life. Her words were apt because I'm learning to plan less, and that isn’t easy for me. What Now? is a delightful little book filled with wisdom for recent graduates and anyone who's dealing with change (which is basically all of us). 5. 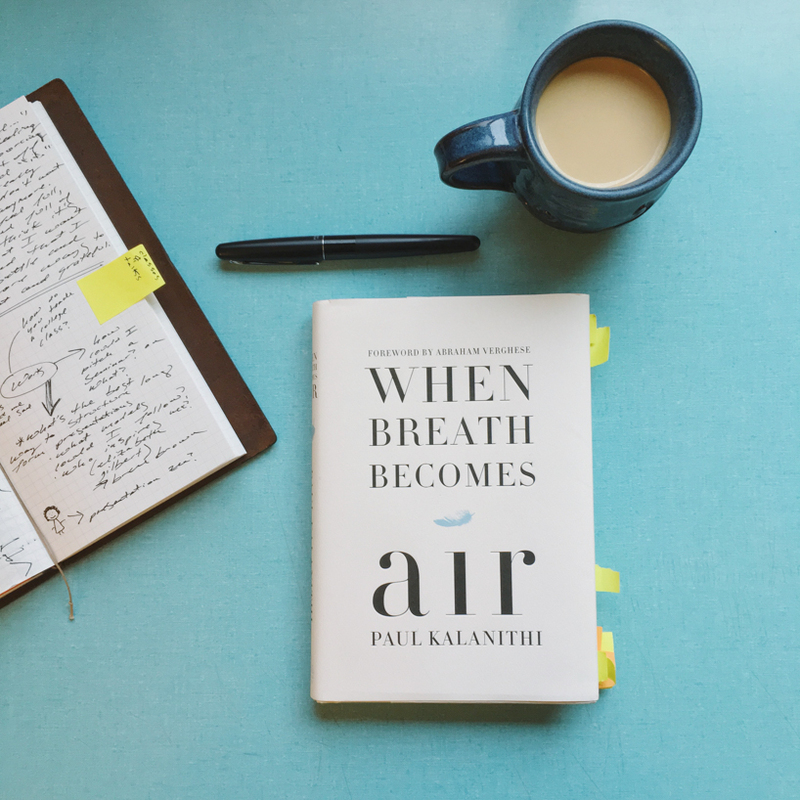 After reading Lucy Kalanithi’s essay—My Marriage Didn’t End When I Became a Widow—and Janet Maslin’s book review, I bought When Breath Becomes Air by Paul Kalanithi. I'm so glad I bought the book because it was an incredibly touching story and Dr. Kalanithi’s prose was gorgeous. When I finished reading When Breath Becomes Air, tears streamed down my face because his words were frank, true, humble, and important. Kalanithi’s honesty about his experience as a neurosurgeon, cancer patient, husband, father, writer, and his thoughts about what makes life worth living in the face of death moved me deeply. What books did you read and love during January? I’d love to hear your recommendations in the comments section.